Tighten up your apron strings dear readers, you’re about to meet your new favorite cookie on the planet. 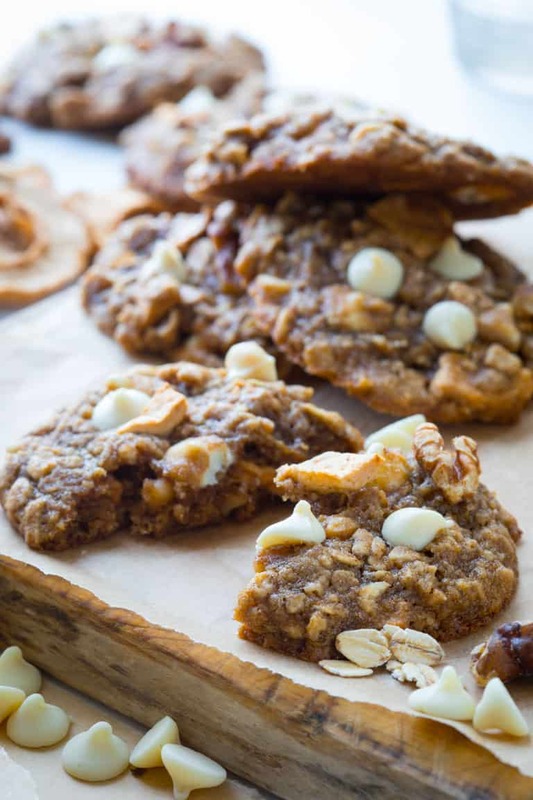 It is a healthier oatmeal cookie with walnuts, apple and white chocolate chips. They have just a touch of cinnamon, sweet butter and they are sweetened with unrefined maple sugar! These cookies are the essence of autumn! I cannot help but swoon when I think of these cookies. They are the best I have ever made. Period. 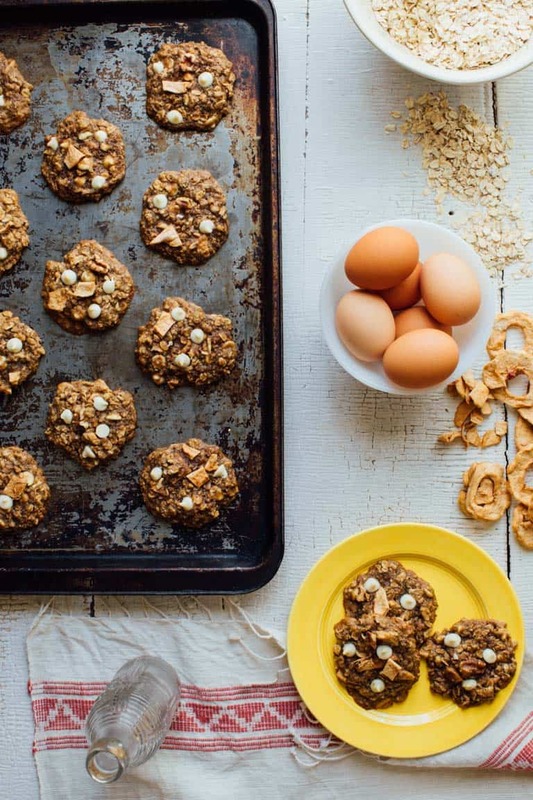 Back in August a friend asked if I had a healthier oatmeal cookie here on Healthy Seasonal Recipes, and I was sort of shocked to realize that I didn’t have one. Shocked because oatmeal cookies are my absolute favorite cookies on the planet. How could this be? I knew that when the fall crept in, it was time to get going on that oatmeal cookie recipe. But I wanted to make sure it was worthy of being my first and only oatmeal cookie. I mean… no pressure. So when the nights got cooler, the days started getting really annoyingly shorter… I knew it was time for that oatmeal cookie to happen. I’ve been tinkering on them for weeks. 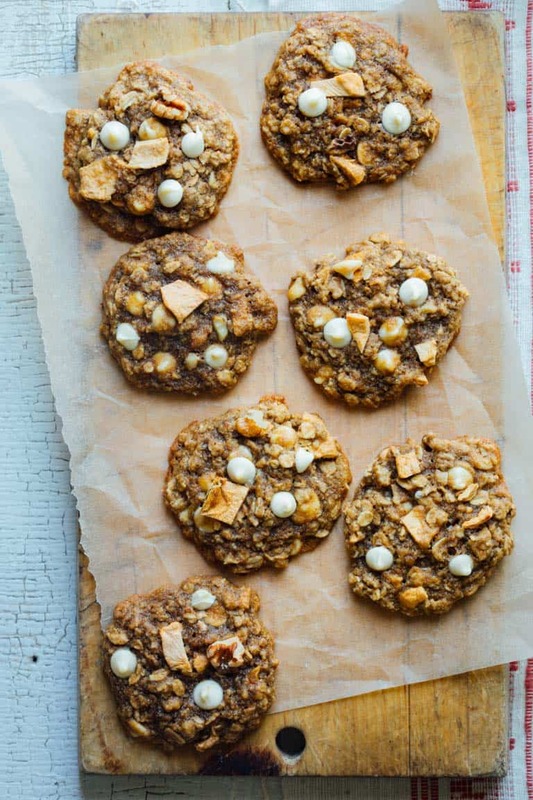 I added in chewy bits of dried apple, crunchy walnuts and sweet creamy white chocolate chips. They reek of fall. (I mean that in a good way.) What I mean friends, is tell your ovens to buckle up… they’re about to get a cookie baking workout! 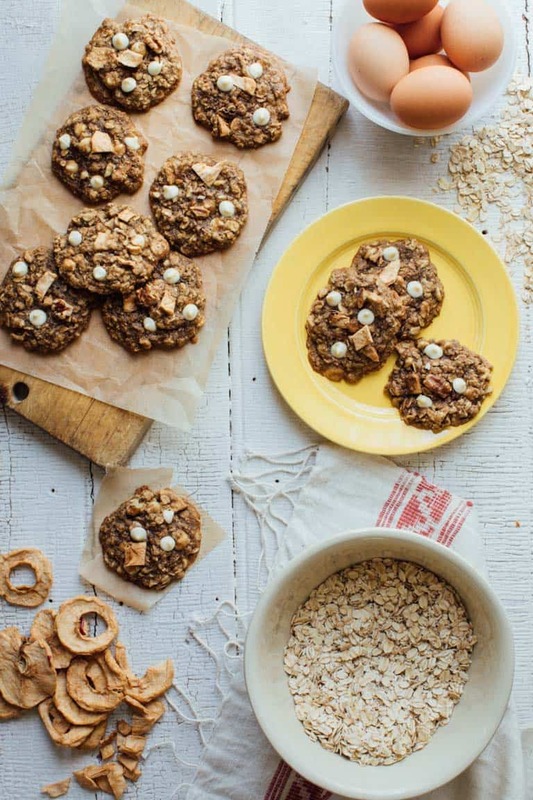 I also knew I wanted my oatmeal cookies to have whole-grain flour in addition to the oats. (Rolled oats are also whole grain.) I used King Arthur White Whole Wheat flour. It is milder in flavor than regular whole-wheat so it doesn’t detract from the flavor of the cookie. 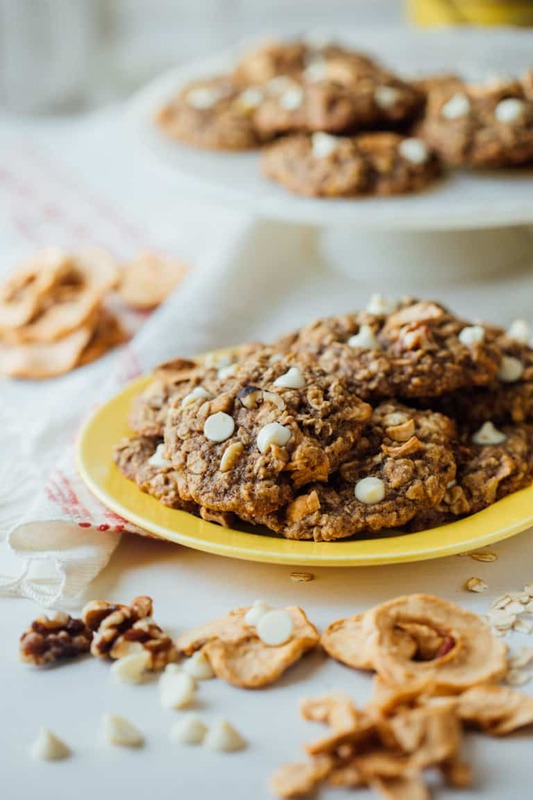 If you are gluten-free, you may want to try these Flourless Oatmeal Cookies by Dishing Delish. 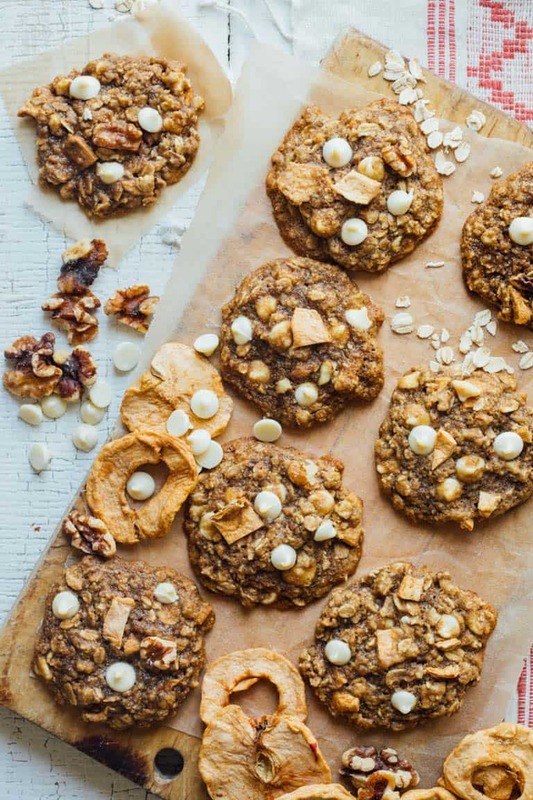 A sweet and chewy oatmeal cookie with chocolate chips and walnuts…yum! I decided to use walnuts in the flour mixture too. I ground them up with the flour to replace some of the flour. They add a nutty richness that really goes well with the maple. I tried it both with roasted unsalted walnuts and raw unsalted walnuts. Either is great, though the roasted walnuts have more nutty flavor. And then comes the butter!!! It had to happen. I wanted to make sure that these were really chewy and lately, I’ve been noticing that coconut oil and I don’t really get along that well. So I decided that one stick of butter wasn’t going to be a bad thing. Especially when divided among 4 dozen cookies. I used a bit of applesauce to stand in for the extra butter, and they still stayed nice and chewy. They puffed up in an unexpected way in the oven, but then when they cooled, they looked more like a traditional oatmeal cookie. I found the apples for these at two local health food stores, but a lot of large supermarkets carry them as well. Like these. Chop them into pieces about the size of a dime. 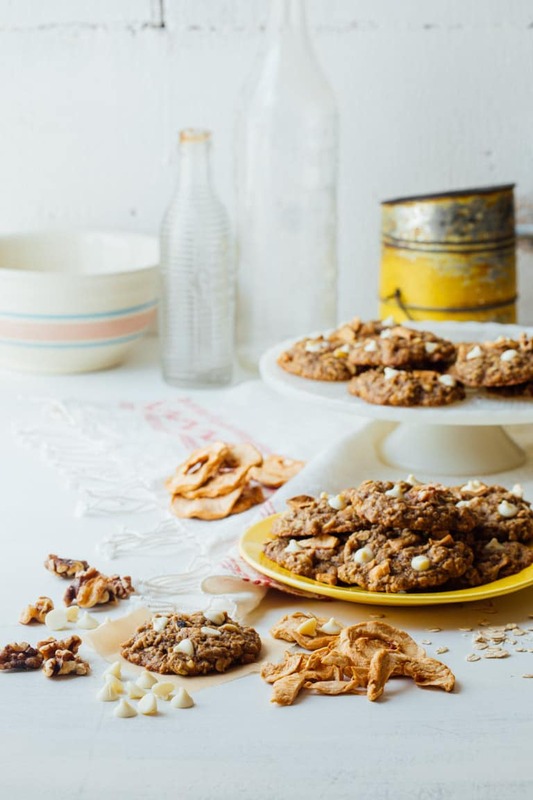 I knew I wanted to sweeten them with granulated maple sugar- which is such a truly magical unrefined sugar– that tastes of the essence of maple. 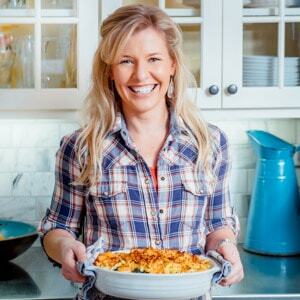 I’m not just saying that because I wrote an entire cookbook about maple, and we have a craft-made maple syrup business. I am telling you all, if you like the flavor of maple (believe it or not there are a couple of people on the planet who don’t) you must try this ingredient!! I’ve been meaning to show you all how to make it from scratch. It’s so simple I just have to film it some time. In the meantime, you can buy it online. I like this one from Republic of Vermont. Basically, it is pure maple syrup that has been cooked until it reaches the hard ball stage, then stirred as it is cooled. The water evaporates out of it in the process, and it turns to granulated sugar. 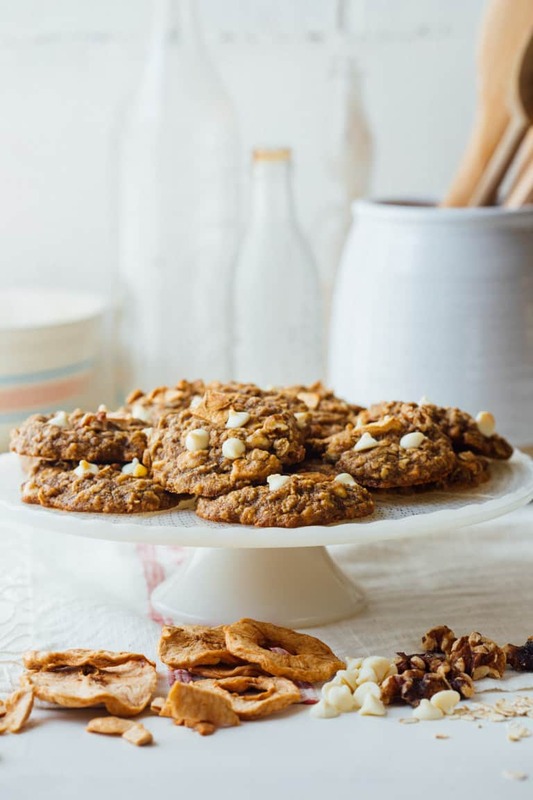 It is a dream to bake with because it doesn’t add liquid- which really helps with texture in a cookie. I hope you try it! After the first test, the cookies weren’t sweet enough and they did not have enough pan spread. So I did end up needing to increase the amount of sugar. I settled on 1 ½ cups. Which sounds like a ton for a healthy recipe, but when spread out over 48 cookies, isn’t so bad. I mean, keep in mind it’s a cookie folks. In case you’re new here, here’s why I think you should eat cookies. One more note on the sugar: I also experimented with subbing in sugar for the granulated sugar. Using all brown sugar worked- kinda. But they were too wet. Instead, I discovered that you can sub in ¾ cup light or dark brown sugar, and ¾ cup granulated white sugar for the 1 ½ cup maple sugar. The flavor isn’t as completely awesome, but they are still majorly good. I think you’ll agree! I like these cookies on the under-baked side. I recommend only 8 minutes. They will seem like they aren’t quite done, but let them sit, and they’ll shrink down into their craggy goodness, and set nicely. Try it! My cross-tester baked them until they were more visibly set- at 12 minutes, and she liked them really well. So it’s more of a preference thing. 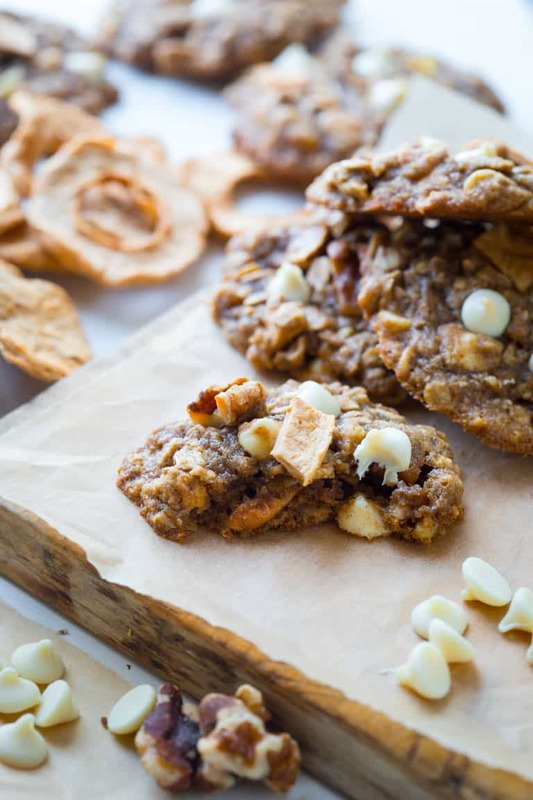 Chewy Oatmeal cookies, with white chocolate chips, walnuts and chunks of dried apple rings added in for a fall twist! Preheat oven to 350 degrees F. Coat two large baking sheets with cooking spray. Grind 1 ¼ cups (3.75 ounces) walnuts in food processor fitted with steel blade attachment until it looks like coarse meal. Add white whole wheat, all-purpose flour, cinnamon, baking soda and salt and process 10 seconds. Chop the remaining ¾ cup walnuts. Beat butter and sugar in a large bowl on medium speed until creamy. Add egg and beat until combined. Add applesauce and beat until completely combined, it is okay if the mixture looks broken. Beat the flour and walnut mixture into the butter mixture on low. 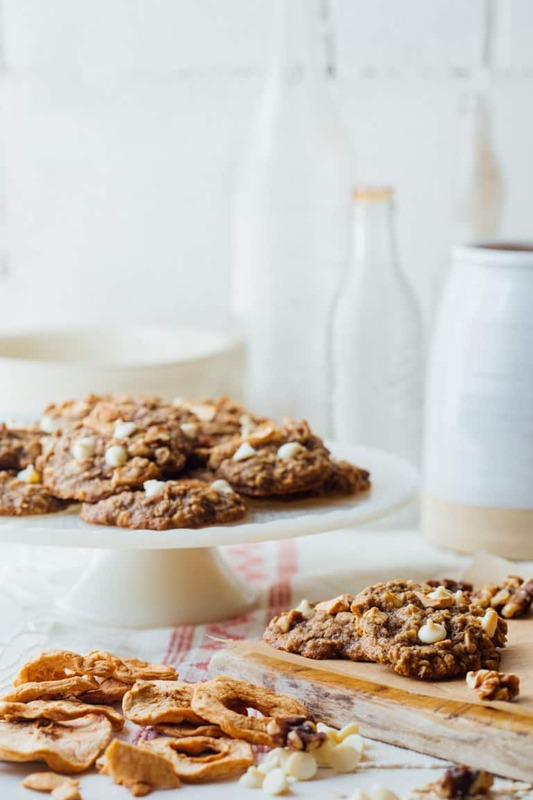 Add oats, the remaining ¾ cup chopped walnuts, white chocolate chips and dried apple and stir by hand with a silicone spatula until completely combined. Drop by heaping tablespoons onto one of the prepared baking sheet, leaving 1 ½ inches between each cookie. Moisten finger-tips and press the dough down slightly. Bake in batches, 1 sheet at a time until the cookies spread and set, 8 to 10 minutes. For a crisper cookie bake up to 12 minutes. Let cool on the baking sheet 3 to 5 minutes before carefully transferring to a cooling rack with a thin metal spatula. Crunchy nuts, chewy apple rings and creamy white chocolate…this sounds like a perfect combo, Katie. Maple sugar..is it white sugar flavoured with maple or real maple syrup in dry form? Thanks Angie. Maple sugar is maple syrup that has been boiled to the hard ball stage and then stirred as it is cooled. Lore suggests that this was how early Native Americans used maple- as opposed to in syrup form, because it lasts much longer and is easier to store. We actually make our own maple sugar quite a bit because we make our own maple syrup and therefor have plenty of maple syrup around to use. I use it in place of white sugar almost exclusively, but it is expensive for a lot of folks. That’s why I offer the alternative to it with half brown sugar and half white sugar combination. What a combo! I like my cookies on the undercooked side too. I never seem to have walnuts at home, but it sounds fantastic mixed into the flour!!! Thanks so much Cathleen. I try to keep walnuts in the freezer, and then replenish when I use them up. I don’t tend to snack on them, like almonds, pecans and pistachios so it is a little easier for me to rely on their being there when I need them for a recipe. I’m allergic to walnuts. Have you ever tried this with pecans? I haven’t tried it, but I’m am almost completely sure it would be delicious and work just fine. Let me know if you try it. I love the apple rings in there! What a great idea! They look super moist and delicious! He Karen! 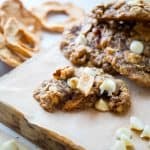 They work perfectly in the cookies because they’re already dehydrated so they are nice and chewy and the texture of the cookie is not compromised. Nota fan of the apples. Do you think it would work without them? It should work without, no problem. Or swap in another dried fruit you do enjoy, such as dried cranberries or raisins. 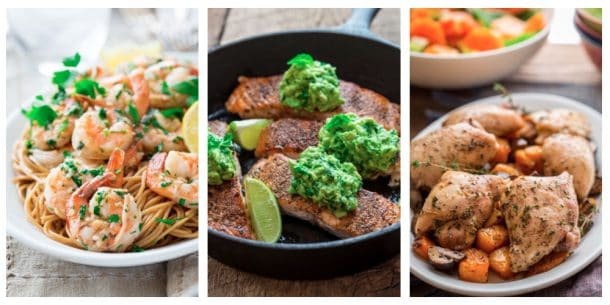 Happy Cooking Mary!